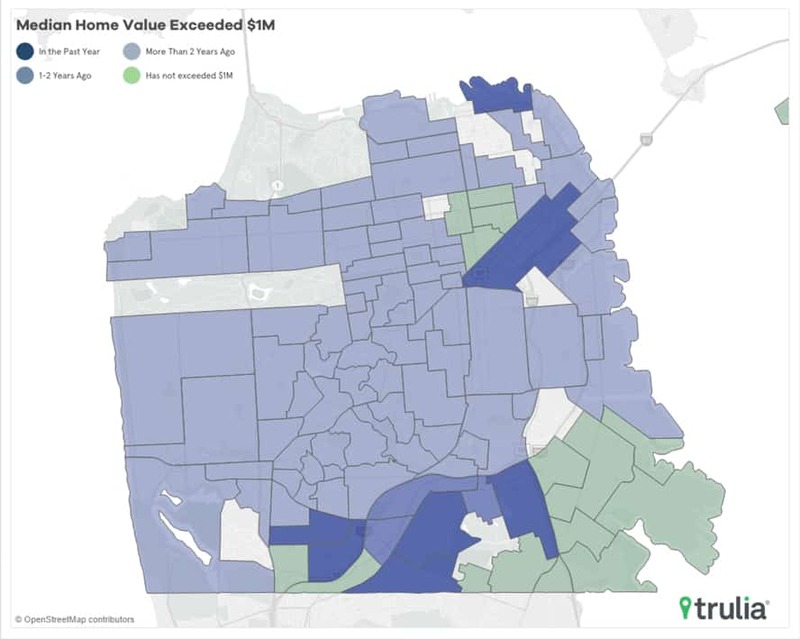 San Francisco’s housing market has been widely recognized as one of the most expensive in the U.S. for the last several years, but a new dataset shows just how profoundly pricey it has become: there are now only 15 neighborhoods left in the entire city where the median home value is below $1 million, according to a new analysis from property portal Trulia released Thursday, which compares data from October 2018 to October 2017. Among the neighborhoods with median home values below $1 million are the Tenderloin, Civic Center, the Outer Mission, and Hunter’s Point. 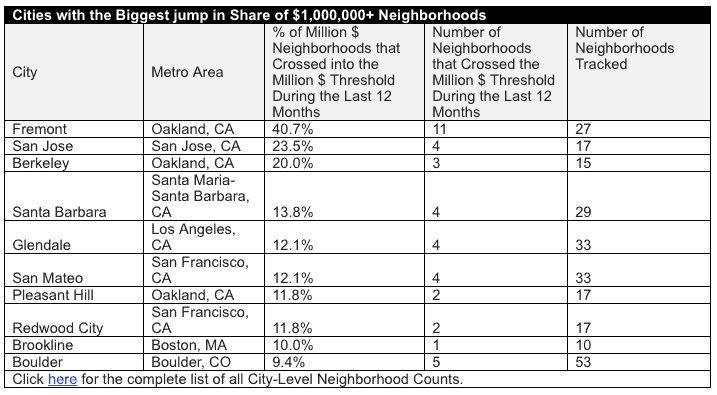 Meanwhile, a total of 87 neighborhoods in the city have median home values of $1 million or greater. Fully 81 percent of all of San Francisco’s homes are worth $1 million or more now, compared to just 67.3 percent this time last year. Trulia’s analysis covered not just the City by the Bay, but the entire U.S. Currently, there are more than 3 million homes across the country valued at $1 million-plus, 3.6 percent of all homes nationwide. That’s more than double the market share held by $1-million properties in 2012 (just 1.5 percent back then). And market slowdown aside, the number of million-dollar homes is expected to grow as home prices increase 7.6 percent year-over-year. Unsurprisingly, the greatest concentration of million-dollar homes is on the West Coast where other markets including San Diego, San Jose, and Seattle continue to lead the pack in home price appreciation. San Jose experienced the biggest increase in the share of million dollar homes: just 55.7 percent of the city had median home values of $1 million or more in 2017, now 70 percent of it does — an increase of 13.7 percent. San Francisco came in a close second with a 13.7 percent year-over-year increase. California dominated the list with Oakland (+5.8 percent), Orange County (+3.0 percent), Los Angeles (+2.1 percent), San Diego (+2.0 percent), and Ventura County (+1.6 percent) having the biggest jumps in the number of million-dollar homes. Seattle (+1.9 percent) and Long Island (1.3 percent) were the only non-California markets to make the top 10 list. With a high concentration of million-dollar homes comes a high concentration of million-dollar neighborhoods, noted Trulia economist Felipe Chacon. When it came to share of million-dollar neighborhoods — where the entire neighborhood’s median home value was $1 million or more — the city of Fremont, California, saw the highest gains. Out of the 15,100 large neighborhoods included in the analysis, 838 had a median value of $1 million or more — two-thirds of which are in California. New York, Florida, Washington, and Colorado rounded out the top five with 82.8 percent of million-dollar neighborhoods being located in one of these five states. Before you begin celebrating that you live in more affordable enclaves, just be aware that million-dollar price tags are coming to a market near you, too: Austin, Indianapolis, and Newport, RI got their first million-dollar neighborhoods this year, and Ft. Lauderdale and Atlanta are expected to join the list in 2019. To be considered in the analysis, a neighborhood needed to have at least 20 homes for which we had a home value estimate, as well as a price trend which didn’t seem to be beyond the realm of reasonable given metro and national trends. For discussions of cities, only cites with at least 10 neighborhoods in consideration were ranked and included in the analysis.